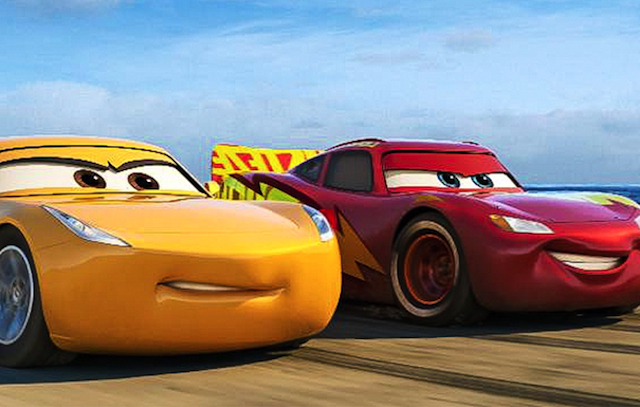 CHICAGO – The Cars movies continue to be the kiddieland of Pixar Animation franchises. Kids adore them, parents tolerate them. Unlike the best of Pixar’s output, the Cars films are lovingly crafted cartoons aimed squarely at kids with far more attention detail than the average fare you’d find scrolling through Netflix. The best that can be said is that “Cars 3” represents a considerable step up from “Cars 2”… which remains the worst movie Pixar has ever produced by a wide margin. Returning to the narrative themes of the first Cars film, this one puts Lightning McQueen (voice of Owen Wilson) back on the racetrack and dials Larry The Cable Guy’s Mater character down to a glorified cameo. This time Lightning McQueen is the esteemed veteran dealing with hotshot challengers. When a gigantic crash knocks him out for the season he must find a way to deal with the changed landscape, and a field of new more technologically savvy racers eager to take his place, led by Jackson Storm (Armie Hammer). In an attempt at a comeback, McQueen signs on with an oily mudflap king as his new sponsor and gets saddled with a new trainer Cruz Ramirez (Cristela Alonzo) to get him back into racing shape. If you guessed that McQueen and his new trainer would detest each other at first, and then gradually win over each others’ mutual respect, then you are quite a savvy moviegoer for a seven year old. But those under that age may be the only ones who won’t see the eventual narrative pit stop ahead.